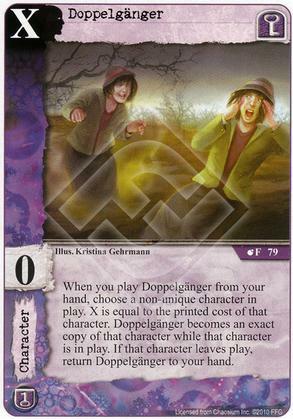 When you play Doppelganger from your hand choose a non-unique character in play. X is equal to the printed cost of that character. Doppelganger becomes an exact copy of that character while that character is in play. 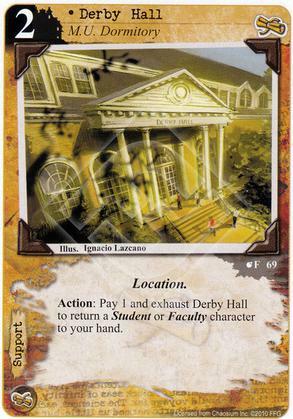 If that character leaves play return Doppelganger to your hand. 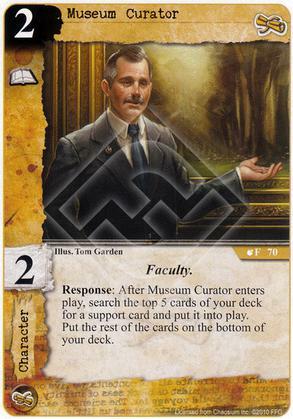 Response: After Museum Curator enters play, search the top 5 cards of your deck for a support card and put it into play. Put the rest of the cards on the bottom of your deck. Action: Pay 3 to force each opponent to choose and sacrifice a character. 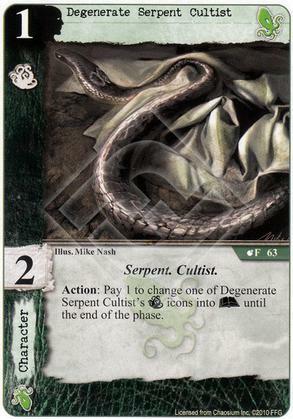 Action: Pay 1 to change one of Degenerate Serpent Cultist’s (T) icons into (A) until the end of the phase. Action: Choose an opponent. 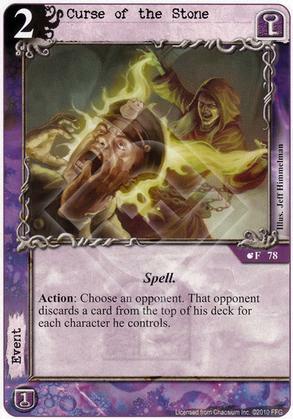 That opponent discards a card from the top of his deck for each character he controls. Action: Pay 2 to give Sam Archer (I) until the end of the phase. 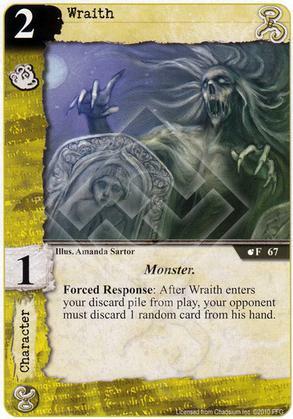 Forced Response: After Wraith enters your discard pile from play, your opponent must discard 1 random card from his hand. 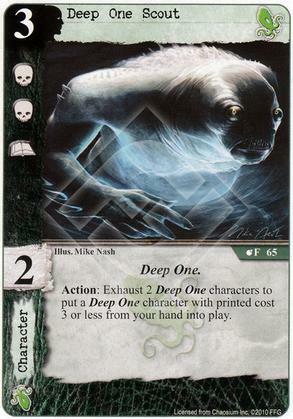 Action: Exhaust 2 Deep One Characters to put a Deep One character with printed cost 3 or less from your hand into play. 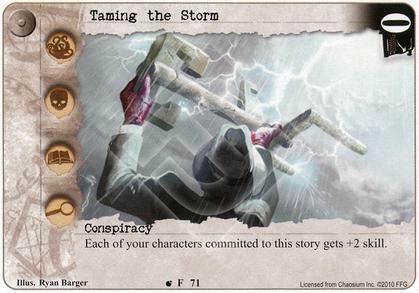 Action: Exhaust Cultist of the Key to choose a story. That story gains or loses an (A) struggle until the end of the phase. 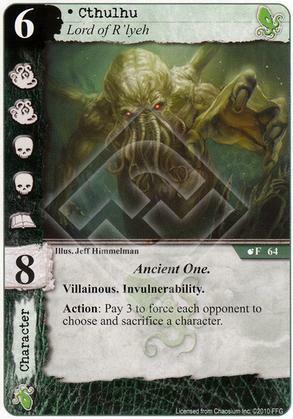 After Smugglers enters play, place your hand on the bottom of your deck. 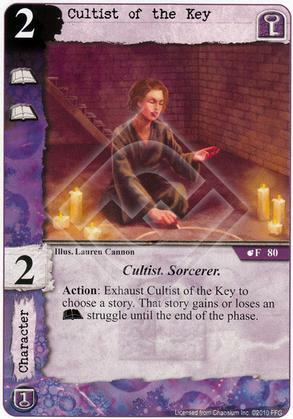 Then, draw cards equal to the number of cards you placed on the bottom of your deck. 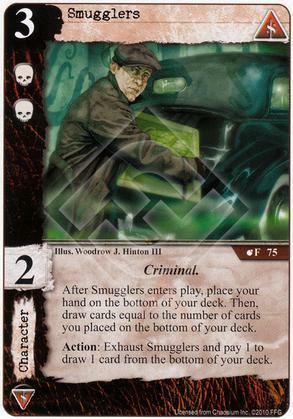 Action: Exhaust Smugglers and pay 1 to draw 1 card from the bottom of your deck. Each of your characters committed to this story gets +2 skill. 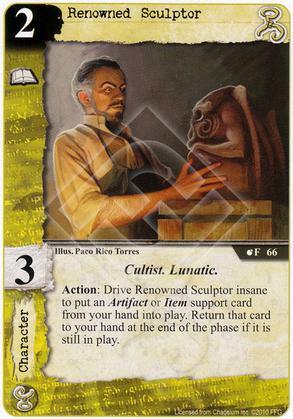 Action: Drive Renowned Sculptor insane to put an Artifact or Item support card from your hand into play. 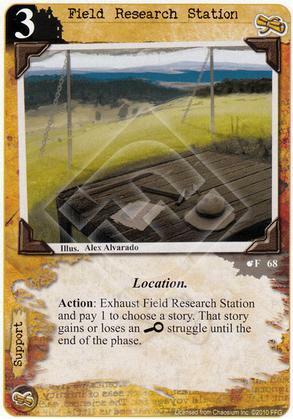 Return that card to your hand at the end of the phase if it still in play. 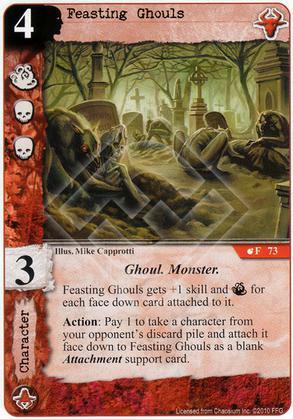 Feasting Ghouls gets +1 skill and (T) for each face down card attached to it. 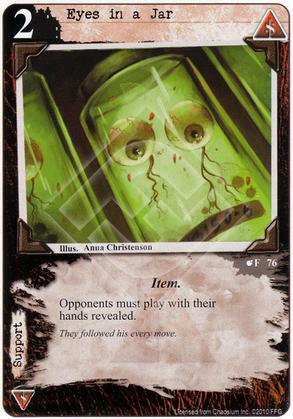 Action: Pay 1 to take a Character from your opponent’s discard pile and attach it face down to Feasting Ghouls as a blank Attachment support card. 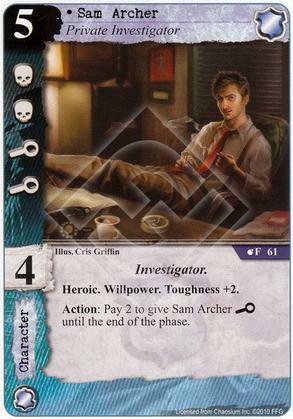 Attached character gains Fast and Toughness +2. Opponents must play with their hands revealed. They followed his every move. 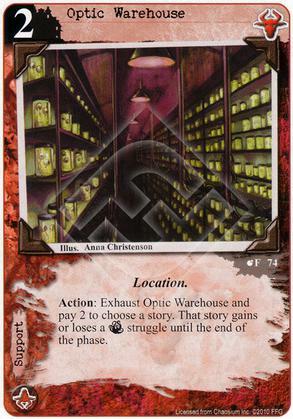 Action: Exhaust Optic Warehouse and pay 2 to choose a story. That story gains or loses a (T) struggle until the end of the phase. Action: Reveal the top 4 cards of your deck. Take one revealed support card and add it to your hand. Place the rest on the bottom of your deck. 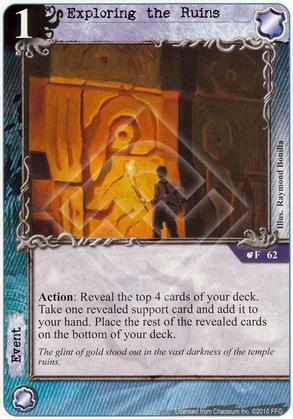 The glint of gold stood out in the vast darkness of the temple ruins. 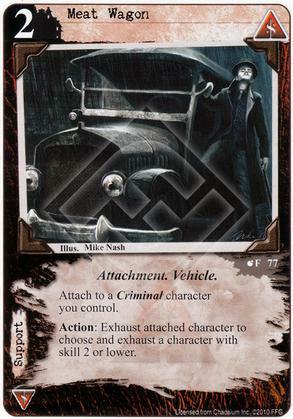 Attach to a Criminal character you control. 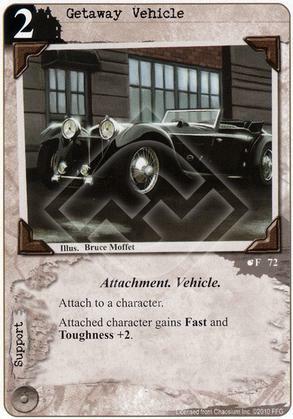 Action: Exhaust attached character to choose and exhaust a character with skill 2 or lower.